Matrimonial website is an evergreen field. If you are an existing wedding bureau or planning to start your full-fledged matrimonial website then we have developed a one-stop solution for you. Due to long experience and technical expertise, we are well aware of the current market requirement and have developed the Shaadi clone script by picking all the salient features of popular websites like Shaadi.com and Bharat Matrimony. Bharat matrimony clone script is suitable for all religions and communities. 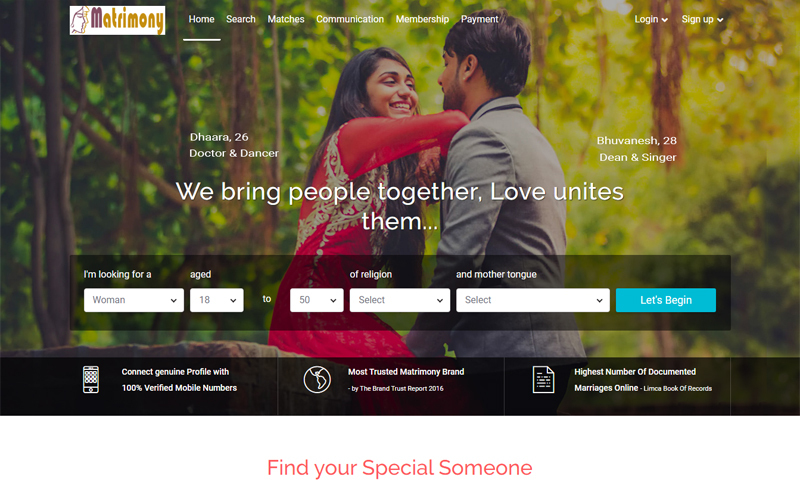 Shaadi Script provides a personal account to each member with all the necessary personal details, allows the members to express interest in any prospective profile and send message to that profile, allows live chatting, provides success stories of successful couples on homepage. We have a clear inbox with advanced features, high secure message system which conveys the profile completed status, upgrade membership level and package details. Customization: We understand that every entrepreneur has an innovative mindset and unique concept. This advanced matrimonial script allows you to easily customize according to your business need so that you do not have to pay extra money for unnecessary functionalities. Also, we have an experienced and dedicated technical team of 25 members to help you implement your business ideas in the product at a very minimal cost. Revenue Model: Through admin you can set different membership packages according to your business plan. Another source of income is the advertisement banners. We have well defined spaces for the banners. SEO optimization: The Advanced matrimonial has a very SEO friendly URL so that your website will always remain in top rank of the Google search pages. Multiple Search: Search functionality is a key point of successful business. Hence we have in build 5 different types of search- Basic, Advanced, Professional, City Based, Id Based. The users can choose any of the options to search as per their convenience. Support Post-Sales: Our support continues even after you buy the product. We understand that the entrepreneurs may not have the knowledge or time to update the website at regular intervals, hence we offer 6 months free update and brand free product! We know that getting your matrimony website to the users is necessary which is why we have made our BharatMatrimony Script to be SEO-friendly by optimizing it in accordance Google standards. Hey friends it is the right place to start your online business because I started here with no technical knowledge. But now I went a long way in this and got benefitted so much. The entire crew helped me so much with all the technical inabilities I had. It is also aided with good design quality. Code quality was amazing and always with brand exponents you can use any script on any demo listed with just one click. Be always make solid amazing, well coded script with great functionality. If you select this script definitely your business automatically grows up!! !